A young family is starting a new life in the hinterland. 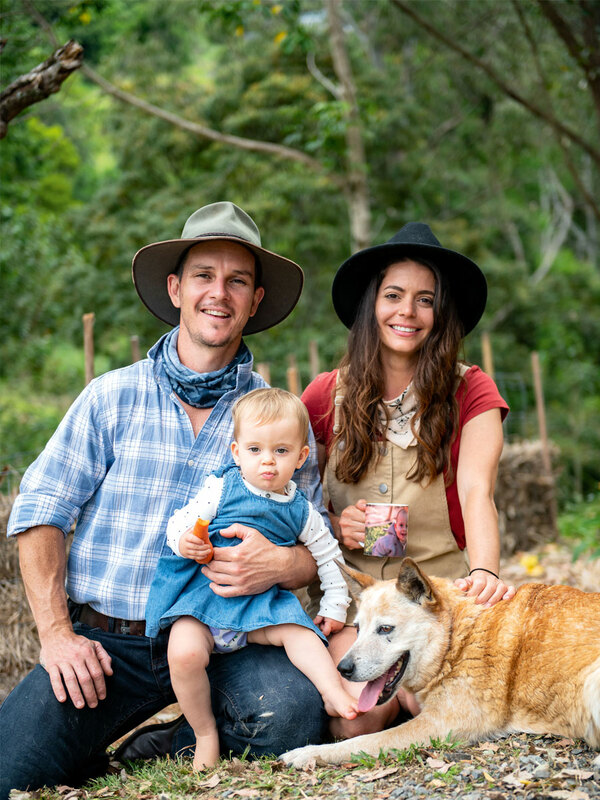 Nestled on the side of a mountain in the Sunshine Coast hinterland, a few hundred metres above sea level on a 35-acre property you will find Joel Clement, Roxy Karas and their 16-month-old daughter Ora. Tired of living a life that left them unfulfilled, the young family took a leap and headed straight off the grid. “We don’t really know where this little move is headed, we only know why we are heading in this direction and it’s an exciting time right now. It’s only just the beginning,” Joel says. I had wondered why such a young family would give up the ease of the modern world for a block of land in the middle of nowhere and a tough life on the land. But sitting in the soft, wet grass watching their daughter play with wild flowers, it all made much more sense. And after a while I could feel it too – that overwhelming sense of nature; fresh air in my lungs. They wanted to create a life that took them back to basics and back to nature, and that’s what they are doing, one hay bale at a time. “It is a work in progress, and one that will most likely continue until the day we die,” Joel says. “The ‘block’ has already been 18 months in the making. We’ve planted over 70 species of different edible fruits, vegetables and herbs, dozens of native species along the creeks and tree lines. We have rotated our cow through the paddocks for about 10 months. This kind of life isn’t a short-term project and one day we will leave this earth and pass it on to Ora. Going off the grid is a scary thought for many, but for Joel and Roxy it seemed like a natural step. “We were so over the mundane day-to-day routine,” Roxy says. “Feeling like a small cog in the wheel of society and feeling the dullness that comes with the machine-driven world. Scrolling through social media we found ourselves liking more posts and signing mountains of petitions to ‘save the planet’, but still felt like we weren’t doing enough. “Seeing what was happening around the world and the destruction that was occurring created in us a level of concern that we think most people now share. With all this information we were tempted to be activists, but we weren’t attracted to the disappointment and negativity that can come with activism. We did, however, want to contribute positively to the future world, a world that we want our 16-month-old daughter to grow up in, a world of regeneration and abundance. So, after many discussions around permaculture and the hopes they shared of an abundant future world, the decision was made to change their lives. “We moved to this much larger property and now grow and eat our own food,” Roxy says. “It’s literally planted everywhere. We should be eating 80 per cent of our food from the block within five years. So far, the block has several large-scale compost systems, a dam brimming with fish, gravity-fed irrigation systems, two fruit orchards and several food forest systems around the main cabin. Watching them interact with each other and Mother Nature is enough to make anyone interested in at least finding out more. The serenity out here is inspiring. It truly is a holistic approach to living and co-existing with nature in a way that has a positive impact on the planet. And this is precisely the message they want others to take away. “For us, a move to the country to do this was the perfect chance to be closer to the natural world,” Joel says. “For many people the change can happen in their own suburban backyard without having to move away. We just hope that we can lead by example and that people will see the joy that comes with a better way of living. A way of life that doesn’t come at a cost to the health of our planet. “We know it’s not possible for everyone. But everyone can make a difference. We are all aware of the disconnect between the ‘Western way of life’ and nature. The deforestation, acidification of our oceans, climate change, the mass extinction of 60 per cent of animals in the past 40 years; it’s depressing stuff,” Joel adds. “We kicked this journey off simple, just one compost patch and a pop-up garden in a suburban block in Caloundra. We had hardly any land, but we managed to eat food and chicken eggs from our backyard. Roxy says things like ditching the takeaways for keep cups, composting food scraps, starting a herb garden or vegie patch, and becoming more aware of water wastage are all things others can do that can make a big difference too.